This is our second Halloween in a new neighborhood. Last year was fun — we ran into our neighbors and squared the block with them, then answered the door for the few dozen people who came by.This year was like no other Halloween I’ve ever experienced. The realtor who represented the sellers, and many of our neighbors, warned us us to have a lot of candy on hand, at lest 800 to 900 pieces. They weren’t kidding! 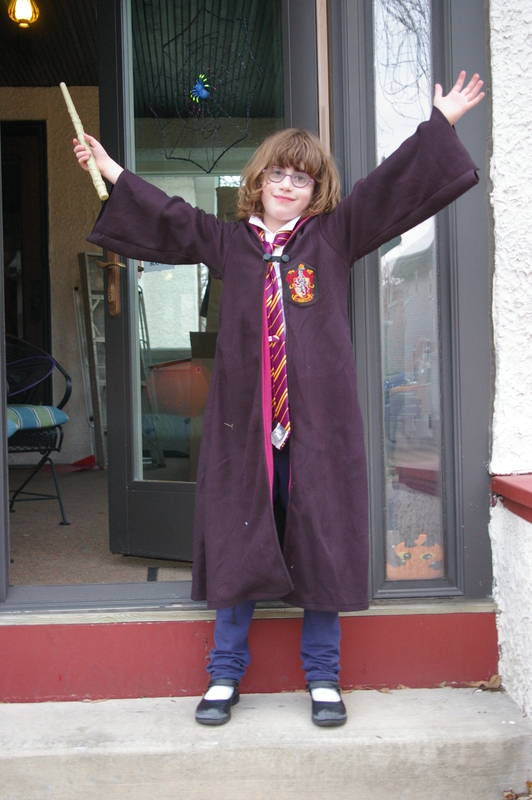 .Charlotte as Hermione Granger (NOT Harry Potter)! Our next-door neighbor lit up the firepit, pulled some chairs around, and settled in. His kids, Charlotte, and the girls across the street ran back and forth visiting for a while. When Charlotte came in for a bath, her friend Karina helped me give out candy. At times there were so many people on our stairs, I could barely keep up. 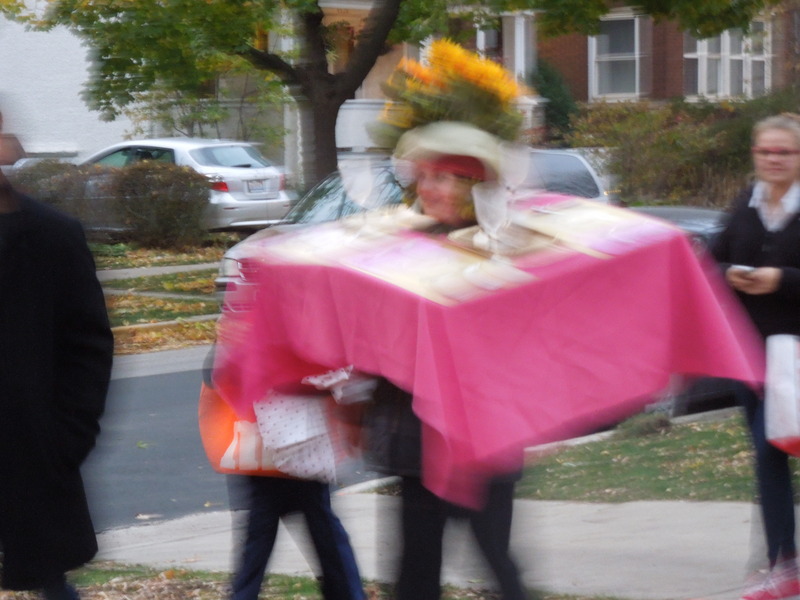 She never stopped moving, but check out this mom dressed as a centerpiece! Oddly, after waiting for weeks for her favorite holiday and having what she declared was the “best school Halloween ever,” Charlotte gave up trick-or-treating after about 20 minutes. She hung out with the neighbors for about 20 minutes after dinner and then went to bed fairly early. We’re wondering if she’s still a bit tuckered out after her procedure last week. Yesterday Charlotte asked me how the tradition of trick-or-treating came about. I was floored by the question so I looked it up on Wikipedia and History.com. It may come from a British and Irish tradition of going door-to-door singing prayers for the dead in return for treats (called “souling”). Other theories connect it to a Scottish tradition first noted in th late 1800s called “guising,” in which costumed people knocked on doors holding scooped out pumpkins and received candy, money, and cakes. The term trick-or-treating seems to have come into modern parlance in the 1950s. It was a great question and I had fun researching it. Normally, you see, we go to the library and get a slew of Halloween books in October. This month was a bit hectic so no books and limited decorating. The question helped us both get more in the mood! Categories: Halloween, Uncategorized | Tags: Halloween, Hermione Potter | Permalink. I didn’t get to go trick or treating with Charlotte last year because of my teaching schedule. I was really disappointed. So, of course I was terribly excited to take her out this year. Lucky me, she wanted to wear the same costume as last year and it still fit. She was talking about going trick or treating “with mommy” all day, so I think she was pretty jazzed, too. Philippe is in Germany for business, so he missed out this year. These pictures are for you, Diddy! Hitting up the neighbors with her buddy Taylor. Yes, Charlotte is VERY tall, but T is about 8 months younger and no shrimp herself! We headed out in Lincoln Square with Charlotte’s buddy Taylor. The girls were very excited to go to each house and get more candy, but not so sure about knocking on the doors by themselves. At around 6 p.m. Charlotte had a meltdown about wanting to get on with it and go to more houses for more candy. I quickly realized that it was a dinnertime meltdown so I had to cut our afternoon with friends short and drag the poor thing home. It was not my best mom moment, involving yelling at her in public and dragging her (literally) back to the car. By the time we got home, all was well and we hit two neighbors’ homes en route to dinner. Charlotte was very excited to see our neighbor’s dog dressed as a pumpkin, but she is still talking about how she didn’t really like the skull with moving eyes in our next door neighbors‘ candy bowl. She was practically too tired to eat dinner (but not to eat candy!). Dinner took forever because Charlotte stopped to yell “Happy Halloween!” and “You’re welcome!” to all of the Trick or Treaters who came to our house while she was eating. When Charlotte finally went to sleep, I recovered with our traditional Halloween treat–cocktails on the front porch with our favorite neighbors, Richard, Cynthia, and Marcy. It’s the one time a year I see Marcy. We had some serious fun involving a radio-activated rat and gals walking to the neighborhood bars. I think she’s a bit sad to see all the Halloween decorations come down. She’s been enjoying all the different spiders in the neighborhood! Categories: Children's Memorial Hospital, Children's Service Board, Halloween | Permalink. Children’s Memorial Hospital: New Doc On Staff? I am sad to report that I missed the first Halloween that meant anything to Charlotte. I was busy teaching (and I let one of my students leave early so she could take her kids trick or treating because I was sad to miss Charlotte’s first outing). from someone that she wouldn’t let out of her site once we got home. 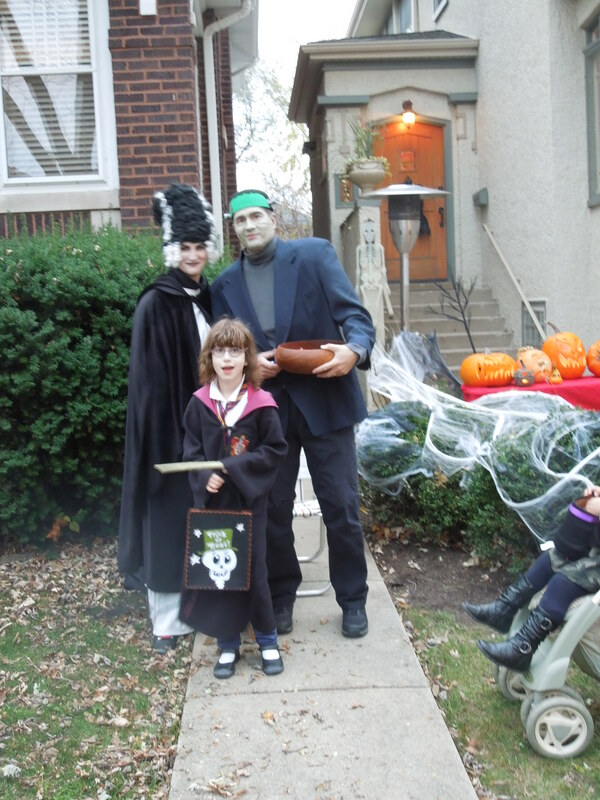 I heard from Karley and Philippe that Charlotte was so excited for trick-or-treaters, too. She gave them candy and when they left, asked to see more. In fact, yesterday morning she was still looking for trick-or-treaters. Charlotte’s costume was a gift from our friends at the Children’s Memorial Foundation. She’s not just a doctor, she’s a bubba doctor. 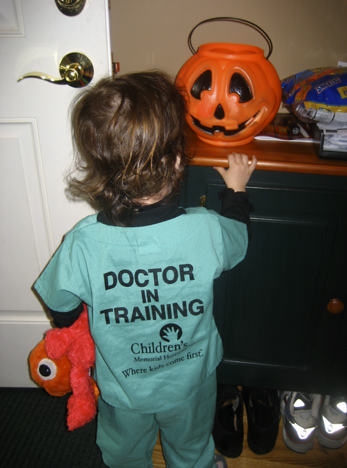 She has already declared that she’ll be a bubba doctor again next year. Categories: Children's Memorial Hospital, Halloween | Permalink.